I had about 6-7 small apples that needed to be used up, so I made this simple dessert. I made up a streusel like that used to make a date square. And placed 3 cups of that on the bottom, pressed flat. Then I sliced up the apples into quarters (or thirds depending on their size). Your choice to leave the skins on or not. As I sliced each piece and cored out the seed, I dipped each piece in lemon juice (pour a little bit on a mall plate). The lemon will keep the apple from turning brown after baking. I placed all the pieces on my cutting board and when done, sprinkled a generous amount of cinnamon (maybe a tablespoon) over the apples and then a little bit of allspice (maybe a 1/4 teaspoon). 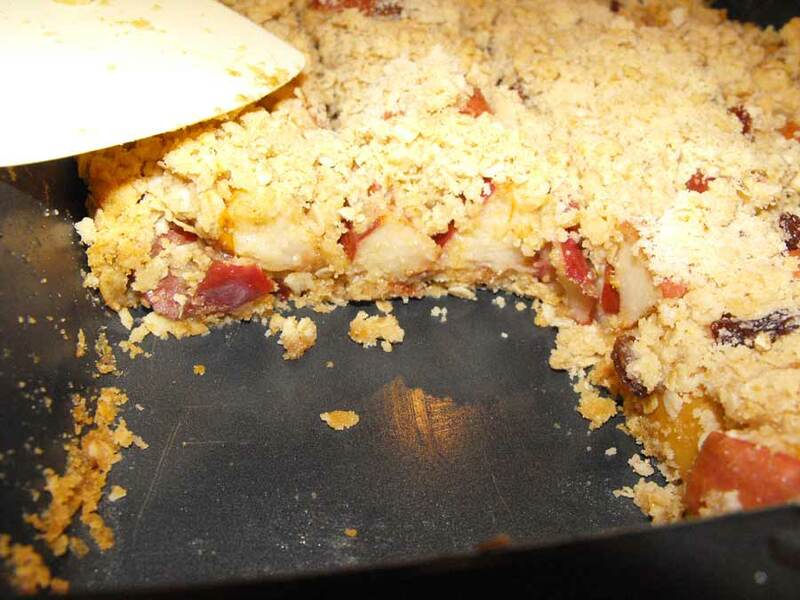 I then placed the apple pieces on top of the streusel bottom. I then added about 1-1/2 cups of raisins to the apples. Finally, spreading the remaining streusel over top, which was about 3-4 cups. Smooth out the streusel, press down slightly and place in the oven, middle rack for 30 minutes. Sides will be slightly browned. For extra crunchy texture and flavour, after the 30 mins, turn on the top broiler to brown the top further. Be careful, stay by your oven as this will only take 1-2 minutes depending on how dark you want it. This can be served right from the oven, its just hot enough. I haven’t tried it with ice cream but it would be delicious, no doubt. To a large bowl, add the oats, pastry flour, brown sugar and baking power. Stir together and break up any lumps of brown sugar. Add the shortening. Mix all together until small crumbles. 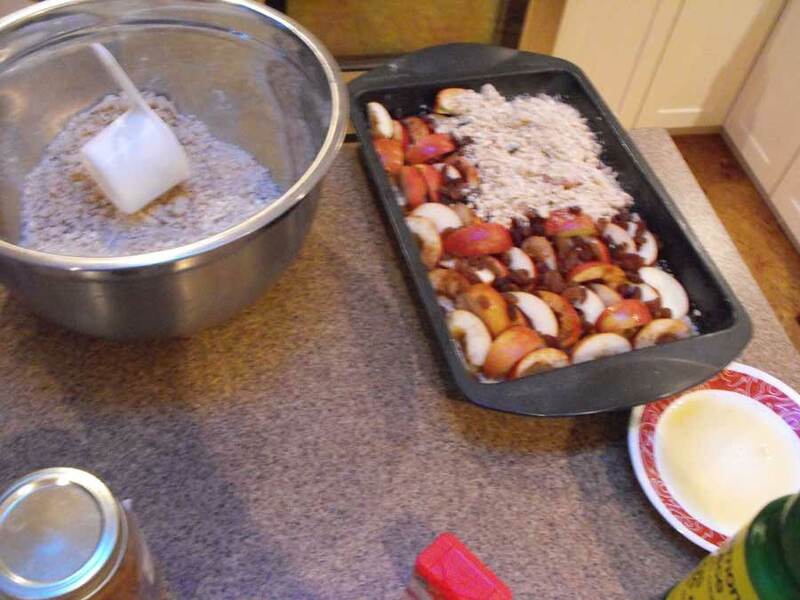 Use your hands, or, like me, use a potato masher (the wire shaped one) to blend the shortening into the streusel. Near the end you can finish up the crumble with your hands if you want. I usually do that, just to make the lumps of shortening a little smaller. That streusel can be put in the fridge or it can be frozen. Usually with left over streusel I’ll freeze it. It can be used right away when needed. A snack idea: On your next dish of vanilla ice cream, take some streusel from the freezer to sprinkle over the ice cream. First put the streusel in a microwave for a few seconds until warm, then add to your ice cream. Looks yummy!! Could you use normal flour instead of the pastry? You could use normal flour, the streusel will have a slightly different flavour though. I would say wait until you are at the grocery store and pick up a small bag of cake/pastry flour.